The first indication may have been the stage. Simple risers, a few lighting rigs, a couple of modestly-sized video screens. No frills, no apparatus on the stage jumping out as a potentially showy production element that would be a source of modern arena spectacle. There was even a huge drum sitting curiously by itself, looking quite lonely on the highest riser behind the drum set. Basic. Solitary. But man, could it resonate. Also resonating on this night were two old lions of 70s rock, Detroit's own Bob Seger and affable guitar wiz/class clown Joe Walsh. A more precisely curated concert duo representing the halcyon days of FM radio is tough to imagine, and on this warm Portland evening, they turned up the heat and turned out the hits (and more) to impressive effect. Walsh took the stage first, laying into the James Gang's rhythmic, insistent hit "Walk Away," enhanced by three backing singers and a band boasting two drummers and a percussionist. With his witty between-song banter and comically sparkly disco shirt, the easiest-to-like Eagles member was so charming, even that universally feared "here's our new song" moment was eaten up by the crowd. It helped that "Analog Man," the title track to Walsh's 2012 album, is a cutting meditation about the world's intractable free fall into absolute digitalism. Hearing a codger lament about advancing technology while audience members captured it all with their digital toys was a delicious slice of irony indeed. The singer-guitarist performed just seven songs, yet made a strong impression, effortlessly knocking out his signature classic "Life's Been Good" and the heavy-riffing, talk box-inflected "Rocky Mountain Away." 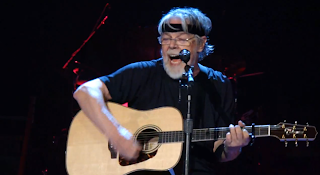 Seger's two-hour show for this "Rock and Roll Never Forgets" tour was put into motion with the thesis statement of "Detroit Made," a John Hiatt rocker that would be the first of five covers he and his longtime troupe the Silver Bullet Band would dole out. The second song, Otis Clay's "Tryin' to Live My Life Without You" was rendered with soul and was a reminder of how many truly familiar, American songbook-ingrained tracks Robert Clark Seger is responsible for. It's surprising how many covers he performs on one level (even the Night Moves album's saucy "Come to Poppa" is a Willie Mitchell tune), but then, he's made so many of these songs his own that the lineage of the music takes a back seat to the feeling being put across. Age 67, utterly white of hair and beard, and donning a jet-black athletic headband that only highlighted his apparent wholesale rejection of Just for Men, Seger nonetheless commanded his band and the Rose Garden with a smile, a fist-pumping verve, and a Vegas entertainer's graciousness. The well-calibrated presentation oddly felt like something that would fit in Vegas, with its middle-aged backing singers, graying drummer, and grand scale (14 people onstage). That's not to say it was corny or phoned-in, as Seger truly shined and struck deepest when he sat center stage with an acoustic, delivering "Mainstreet," "Against the Wind," and "Night Moves" with the Silver Bullet band fleshing out the sound behind him, perhaps most notably longtime sax player Alto Reed (who, as it turns out, has not at all eschewed hair color enhancement). Seger, like John Mellencamp or Bruce Springsteen, has always been a blue-collar hero, a populist Midwesterner singing about, and spiritually connected to, hard-working regular folks. "Like a Rock" was dusted off for this tour for the first time in 17 years, and though it unavoidably recalls the Chevy truck commercials it provided the soundtrack for, its intrinsic message and meaning still managed to break through. The middle section of the show flagged a bit with "Beautiful Loser" and "Roll Me Away," as well as Seger's over-reliance on having the crowd sing his choruses for him, but a rebound wasn't far behind with the surprise cover of Ike and Tina Turner's "Nutbush City Limits," the reliably haunting "Turn the Page," and the roof-blowing "Katmandu." "All the Roads" was the one new original that Seger offered. Reflective lyrically and definitely in line with the Rock Hall of Famer's admission that he will stop touring in the near future, it was a sentimental if slight piece. But no matter; at this point, few Seger fans are looking for anything new from this living legend. Most are looking for a trip down memory lane, a reason to hoist a beer and experience songs that remind them of gloriously lost American nights, lost American dreams, and full-on American redemption in the form of a carefree, rocking Saturday, which was so resoundingly offered here.